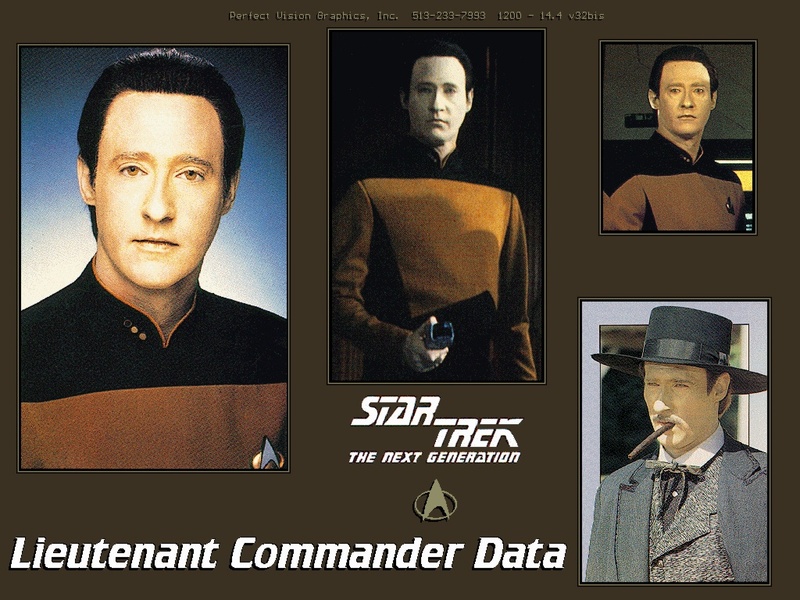 Data is a humanoid android who is discovered and reactivated by the crew of the HOKULE`A-class Starfleet ship U.S.S. TRIPOLI NCC-19386 on OMICRON THETA IV in 2338. His post activation months are very difficult, but the crew who find him are helpful, and Data is so impressed by their actions that they inspire him to join Starfleet. His decision has far-reaching consequences, both for Starfleetand, potentially, for other androids. His entry into Starfleet Academy is the first, and so far only, one by an android. His entry is facilitated in 2341 by a legal decision rendered by a Starfleet Academy entrance committee, they decree that Data is a sentient life form. This permits his entry to the Academy and his eventual service as a member of Starfleet. The only vote against Dtat`s entry is cast by BRUCE MADDOX of the DAYSTROM INSTITUTE. Data and Maddox cross paths again in 2365, when one of the most important events in Data`s career has a lasting influence on Starfleet, a redefinition of the rules concerning artificial life, which is forced by Data`s attempts to resign from Starfleet rather than undergo experiments which could cause permenant damage. A Judge Advocate General`s inquiry at Starbase 173 rules that Data is not Starfleet property and cannot be treated as such, further upholding his sentient induvidual rights. While problems concerning Data`s status can be solved by the rule books, other elements of life in Starfleet are not so easy to resolve. Data finds the orginization`s entrance exams elementary, but in his freshman year at the Academy he discovers his biggest problem to be that of social interaction. In particular practical jokes and the SADIE HAWKINS DANCE baffle him. Despite these problems, Data graduates in 2345 with honours in exobiology and probability mechanics. His cirriculum also includes advanced training in auxiliary vessels. Following graduation, he spends three years as an ensign and 11 more in the lieutenant grades. One of these postings is to the U.S.S. TRIESTE NCC-37124. Data recieves his first promotion, to, lieutenant, junior grade, in 2348. Due to his programming and super human abilities, he is by definition an exemplary officer. So far, however, he has not made any significant advances in the area of command, Data`s service to Starfleet has been in the operations department only. In 2364, Data is assigned to the GALAXY-class U.S.S. ENTERPRISE NCC-1701-D under Captain Jean-Luc Picard, as Operations Manager. His duties include coordinating many departments on the Starship. Data is rarely placed in command even of small away missions, even though on the occasions when he does take charge he acquits himself admirably. One such example of this is his sucessful handling of the evacuation of the TAU CYGNA V colony in 2366. Despite his long, and almost flawless career record, Data is not placed in command of a Starship until assuming the conn of the NEBULA-class U.S.S. SUTHERLAND during the blockade of Romulan aid to the DURAS Klingon faction in 2367-68. Many officers feel uncomfortable being ordered around by an android. But Data soon manages to prove his worth. Data has a routine unlike any other officer in Starfleet, because he doesn`t require sleep, he can work round the clock. He often takes over the night shifts aboard the Enterprise bridge after his normal shifts. After eight years aboard the Galaxy-class Enterprise, Data and most of the rest of the crew transfer to the SOVEREIGN-class U..S.S. ENTERPRISE NCC-1701-E it is aboard this new ship in 2373 that Data is nearly assimilated by the BORG, who are attempting temporal sabotage with earth`s past and Humanity`s FIRST CONTACT with an alien race. Data resists temptation and saves Picard and his ship.